SunMaster Products is a family owned and operated business which was founded in 1971, and since that time, we have designed, expertly-crafted, and precision-installed stationary and retractable awnings, canopies, solar screens, blackout shades, drop roll curtains, sunroom shades, skylight shades, and patio cover shades at affordable prices for homes, businesses, industrial facilities, and institutional clients in Ramona and throughout San Diego County. But in addition to creating and installing exceptional quality sun shade products, at SunMaster, we can also provide expert fabric die cutting and production sewing services, and have done so for local businesses and manufacturers for over 40 years. At SunMaster Products, Inc., our attractive stationary and retractable awnings, canopies, solar screens, blackout shades, drop roll shades, sunroom shades, skylight shades, and patio cover shades add both value and style to homes and businesses throughout Ramona. We expertly fabricate all of our sun shade system products onsite at our North San Diego County facility, where we have a full service fabric die cutting and production sewing workshop. In addition, we construct our durable sunshade systems entirely out of American made materials, observing the highest quality standards possible, and our sun shade system installations comply strictly with all applicable building codes. 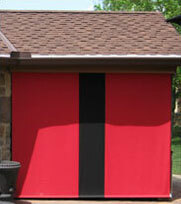 Call the sun shade system specialists at SunMaster Products today. We provide free onsite consultations and estimates to Ramona, and all of San Diego County and the surrounding areas. SunMaster Products, Inc., is licensed, bonded, and insured. The benefits of installing awnings and canopies at your Ramona home or business goes far beyond aesthetic appeal. The installation of awnings can result in significant energy savings, due to a reduced need for air conditioner usage during warm weather. This is due to the fact that in a typical structure, more thermal transfer occurs through windows and glass doors than through any other architectural element, and this thermal gain caused by solar radiation is responsible for 20 percent of the load on an air conditioner. Trust the professionals at SunMaster to design and install the ideal awning or canopy to remedy this issue, providing the most comfortable environment possible for your home or business's occupants. SunMaster Products, Inc., offers professional fabric die cutting and contract/production sewing services to Ramona businesses and manufacturers. Over the years, since we began our business in 1971, SunMaster has performed our expert fabric die cutting and production sewing services for thousands of satisfied San Diego County businesses and manufacturers, the medical industry, and the United States Military. And these clients appreciate the convenience of having a full service contract sewing workshop which is locally owned and operated, and offers very competitive pricing. 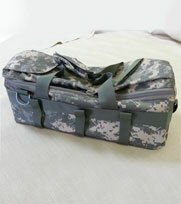 Trust the professionals at SunMaster with your fabric die cutting or production sewing project. Call us today to schedule a free consultation and estimate, anywhere in San Diego County. At SunMaster, our skilled craftsmen observe the highest standards of professionalism in all that they do, and construct our retractable awnings to be both durable, as well as to function exceptionally well throughout the duration of their lifetimes. Retractable awnings enable Ramona home and business owners to control their indoor environments, by regulating the amount of sunlight and thermal transfer that occurs through the windows and glass doors in their residential or commercial properties. In warm weather, at times during the day when the sun's rays are focused directly on a home or commercial building's windows and glass doors, retractable awnings can be extended, shading windows and glass doors from the sun's penetrating rays, and blocking the thermal gain this sunlight would produce within these structures. 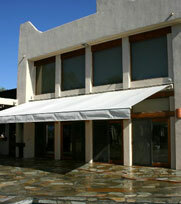 And conversely, in cold weather, these awnings can be retracted, to allow the sun's rays to help warm interior spaces. In fact, it has been determined that retractable awnings enable home and business owners to save an average of 35% on their heating and cooling bills, simply by taking advantage of these sun shade systems' versatility on a year round basis. At SunMaster, we offer our custom-designed retractable awnings to Ramona home and business owners in an extensive selection of fabric types, colors, and patterns, and in manually-operated and motor-operated designs. All of our awning framework is master-welded by licensed welders, and all necessary electrical work is performed by licensed electricians. Call SunMaster today. We offer free estimates to all of San Diego County, and are licensed, bonded, and insured. 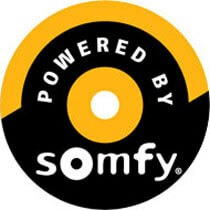 Depend upon the experienced professionals at SunMaster. At SunMaster, our solar screen specialists will work closely with you to develop a customized shade solution which best meets your needs while also complimenting your Ramona home or business's decor. Sun screens and solar screens are available in both interior and exterior mounted systems, both of which help to reduce heat transfer through windows and glass doors, filter the sun's glare, and block harmful UV rays from entering your home or business's interior. At SunMaster, all of our sunscreens, solar screens, and blackout shades are available in a choice of fabric colors, and in manually-operated or motor-operated designs. At SunMaster, we appreciate the fact that while skylights and sunrooms are wonderful for admitting natural light and warmth into Ramona homes and businesses, that at certain times of the day and in certain seasons, this natural light and heat can be excessive. At SunMaster, our skylight and sunroom shades are available in a choice of fabric types and densities which will effectively block the sun's glare and minimize heat transfer through all types of sunrooms and skylights, including curved and flat glass skylights, and curved eave, gable roof, and flat slope roof sunrooms. Call us today. Trust SunMaster to custom-design, hand-craft, and precision-install the ideal awning system for your Ramona commercial or industrial property, supplying your business with a bold design accent which is both sophisticated and also provides a welcoming statement to potential patrons. In addition, we can outfit your new awning with your business's name and logo, hand painted by a professional graphic artist. 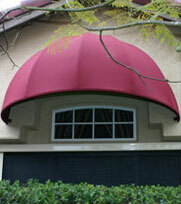 Call the awning specialists at SunMaster Products today. We offer free onsite estimates to all of San Diego County, and accept Visa, Mastercard, Discover Card, and American Express. Let the awning recover specialists at SunMaster rejuvenate your existing awning or canopy at your Ramona home, business, or industrial facility. 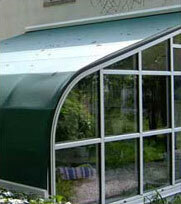 At SunMaster, our awning recovering services can grant existing awnings a whole new lifespan. Fixed and retractable awning systems and canopies can be recovered several times, precluding the need for complete system replacement. And at SunMaster, we offer our recovering services in an extensive selection of fabric colors, patterns, and types, including Sunbrella fabrics – backed by a 10 year warranty. In addition, when existing awning or canopy framework shows signs of weathering, we can refinish this framework in a choice of over 100 powdercoat finish colors, prolonging its resistance against the elements for years to come. Call us today. We offer free onsite estimates to all of San Diego County, and accept Mastercard, Visa, Discover Card, and American Express. At SunMaster, we offer our fixed and retractable patio shades and drop roll curtains to Ramona in an extensive selection of fabric types, colors, and patterns, including Sunbrella fabrics. Sunbrella is an acknowledged leader in the outdoor textile industry, and stands behind its exceptionally durable fabrics with a 10 year warranty. At SunMaster, our extremely durable tarps and equipment covers can be sized to fit any type of Ramona equipment or machinery, and provide a very effective shield against the elements. They are offered in a choice of fabric types, patterns, and colors, including Sunbrella solution dyed woven acrylics; and Weblon, Vanguard, and Ferrari 100% waterproof vinyl coated polyester. Sunbrella fabrics come in over 350 colors and patterns; and Weblon, Vanguard, and Ferrari vinyls are available in many solid colors, and provide 100% UV blockage. Call the experts at SunMaster Products today, for San Diego County's best value in custom shading solutions. We offer free onsite estimates throughout our service area, and are licensed, bonded, and insured.